You know how everyone has a thing they’re into? For example, my dad’s thing: Coca-Cola. He has Coke ornaments, cups, sweaters, pens and even an old-fashioned Coke diner booth installed at his house. My coworker’s thing is dolphins. My mom’s thing is unicorns. 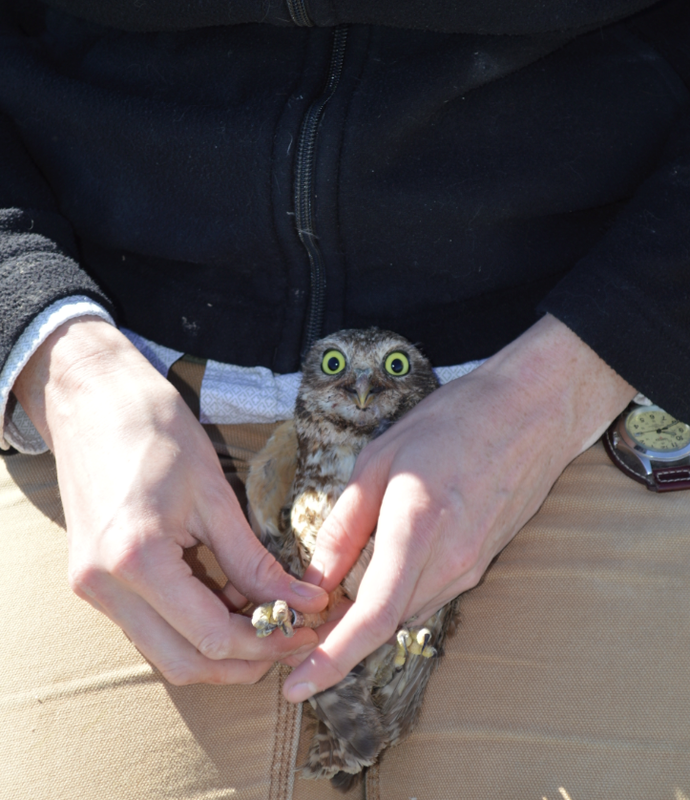 We pulled this owlet — along with its sibling — from a man-made burrow in Tooele. My thing is birds — especially owls. (And for the record, I liked them before they were hugely trendy.) I decorate with owls, watch videos of owls and take photos of owls. My daughter’s first animal sound was “hoot.” I’m not a biologist or any sort of bird expert, but my job with the Division has allowed me several opportunities to see different birds up close and learn about their behaviors. Elusive, stealthy birds of prey with haunting eyes and unique habits and territories — it doesn’t get much cooler than the owl. Last week, I had a delightful experience that made me giddier than my wedding day. I was invited to join biologists and researchers as they banded burrowing owlets. Tiny, downy, newly hatched baby owls? Count me in! 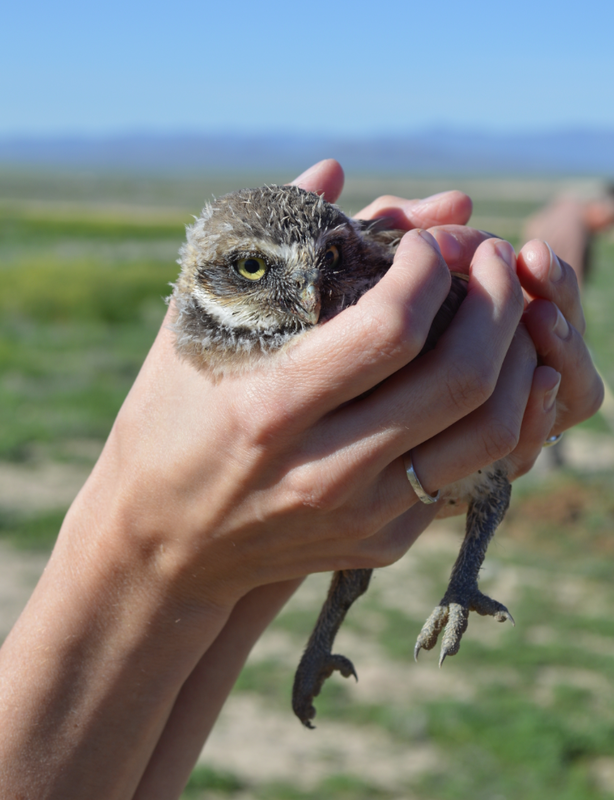 A few months back, DWR biologist Tony Wright shared this blog post about the burrowing owl study we’re helping with. Although the species is not in big trouble yet, their numbers are declining in different areas of the West, and biologists from all over are working together to figure out why. Crystal with a nine-day-old nestling. Right now, we’re in the process of retrieving some of the geolocators we placed on burrowing owls last year. Now that nests are well established, it’s the perfect time to head afield to look for the geolocators and to place bands on the legs of this year’s newest owlets. Attaching a small metal tag to the leg of a bird enables individual identification and makes it easier keep track of their movements and behaviors. Carl Lundblad, PhD student with the University of Idaho research group, has placed cameras at nest sites in California, Oregon and Utah. This will provide a better understanding of geographic variation in owl breeding behavior. Carl shares some of the video clips with us, and we post them to our DWR Facebook page. I highly recommend you watch this creepy clip of an uninvited visitor descending onto one of our burrowing owl mamas. During our visits to several nest sites near Tooele last Friday, I watched experts trap, band, weigh, measure and release dozens of owls. And yes, I got the chance to hold (read: snuggle and baby talk) a few of the owlets myself. 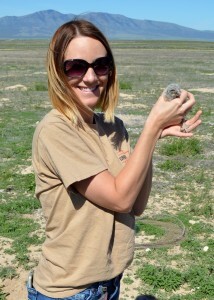 One of the chicks we retrieved from a burrow was actually too young and small to band yet — only nine days old. The baby animal cute factor was off the charts. Placing bands on owls helps us track their movement and behavior. I don’t blame anyone for not laughing when I jokingly asked if I could keep one of the owls as a pet. They’re just adorable and soft and light and curious — and I couldn’t get enough! Did you know this particular owl species can dig with its bill and kick dirt with its feet to excavate a burrow? And unlike other owls, they’re active during the daytime hours. And the head bob — oh the head bob. Their trademarks are too awesome to describe, which is why I’m now sending you to YouTube. Charm aside, this is a special species, important to the ecosystem, and I’d like to see them thrive in Utah for many years to come. Catching the owls was the fun part, but we hope to learn the movements of these little guys so we can help them prosper. We’ll continue to keep you posted on any developments in the research. As for me, I think it’s safe to say the burrowing owl is currently at the top of my favorite animal list. I will continue to welcome the influx of owl shot glasses, clothing and salt-and-pepper shakers that I receive as birthday gifts. Great story!…congratulations on getting to work with owls!!! Come up to Salt Creek Waterfowl Management Area. We have a few burrowing owls, short eared owls, and great horned owls this year you can see. Hi Nuala. Our agency doesn’t do a lot of rehab work with owls. We partner with other agencies to do banding work from time to time, but we don’t outsource volunteers for that type of project. If you’re interested in helping rehabilitate owls and other birds, I would suggest reaching out to wildlife rehabbers in the state. They are always looking for volunteers. I have experience with Southwest Wildlife Foundation of Utah (https://www.gowildlife.org/) and the Wildlife Rehabilitation Center of Northern Utah (https://wrcnu.org/). You can see a complete list of the rehabbers the Division works with at https://wildlife.utah.gov/learn-more/258-wildlife-rehabilitators.html. Good luck with your owl adventures! There is an owl that is trapped in a new school they are building in Eagle Mountain, Utah. The new high school on Pony Express in the city center. He has been “built” inside and nobody is helping him get out. Hi Sue. Our Avian Conservation Program Coordinator would like some more details. What’s a good phone number for you?